Do you still ask your attendees to physically raise their hands, do a headcount manually, or pass a microphone around when people want to share their thoughts? Have you wanted to gather their feedback to develop an event program, but found that simple surveys never get you the results you want? 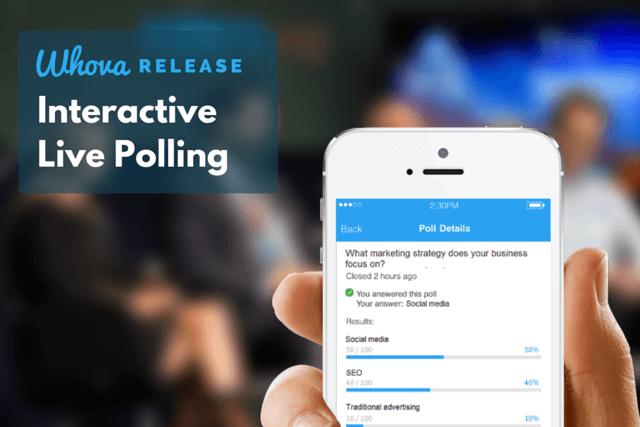 Look no further for a feature that can capture your attendees’ thoughts and feedback in a way that is engaging, interactive and effective as we’ve released Live Polling! Collect votes effortlessly and accurately without needing to spend time and resources for manually counting, gathering feedback, and generating engagement. While not easy, generating audience engagement is key, especially at a large event or with content-heavy presentations. Rather than having speakers merely talk at the attendees and deliver information one-way, I’m sure you would like to have a way to stimulate discussion and create a meaningful interaction between speakers and attendees. Live polling provides opportunities for your speakers and moderators to ask thought-provoking questions that can catch attendees’ attention and orient them to a certain topic. For example, during transitions, speakers can ask the audience to express their opinions via a live poll and display responses as they dynamically roll in, creating a collaborative learning experience that is interactive, engaging and attention-grabbing. Running a live poll during a product demo, idea pitch, or panel discussion is a unique way of effectively collecting instant feedback from industry experts or target customers who are present during a session. Not only can you collect their valuable ideas with an open poll, you can utilize their feedback to improve the way the session goes. Let attendees help guide the direction of the talk and choose the next topic so they feel like they’re part of the conversation and can appreciate the relevancy of your speakers’ talks. 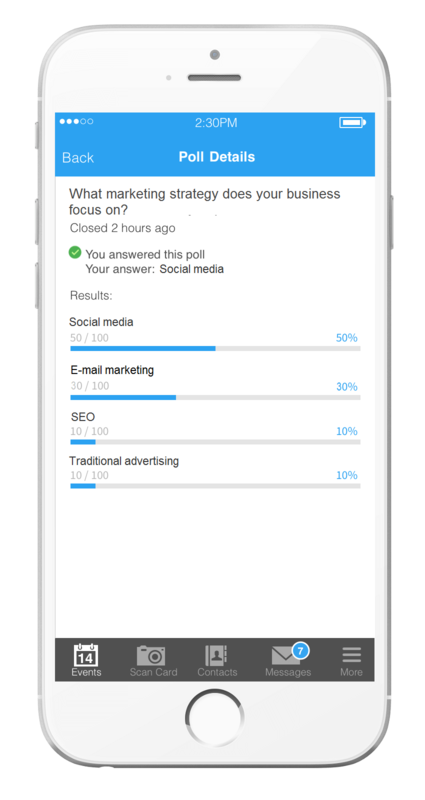 If you have a competition, such as a startup competition, use live polling as a priceless method of tallying votes. You can empower your attendees to judge contestants and vote for their favorite team. In addition to an official winner selected by judges, the audience can appoint an official winner for a people’s choice award. Participants will be allowed to cast one vote anonymously before seeing the current voting results. With Whova’s live polling feature, you can instantly get accurate results without spending the time and resources needed to manually count votes. The voting progress dynamically updates, ensuring accuracy and eliminating the need to count the votes yourself. Prior to an event, you can easily gauge what number of attendees would be interested in participating in certain event activities, sessions, or meetings and take that data to adjust your programs or assign appropriate rooms to particular sessions. To proactively involve attendees, you can collect attendees’ interests in various topics and develop an event program that is most useful and interesting to them. 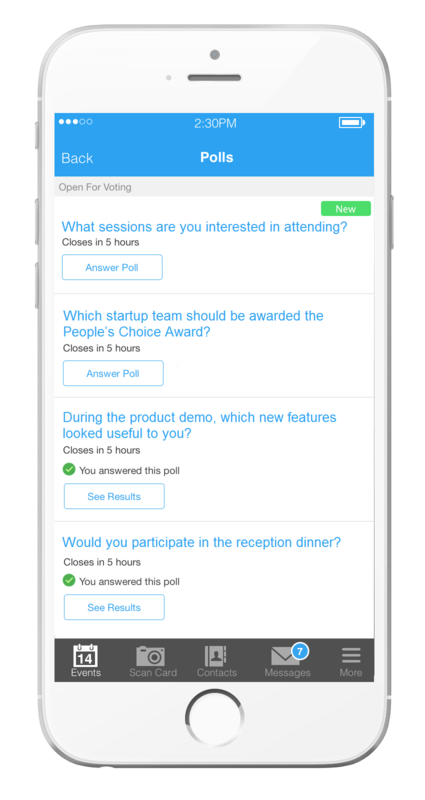 Make informed decisions at the drop of a pin on important aspects of your event with the power of live polling. For example, you can adjust the amount of food and beverages for a reception dinner or a lunch based on attendee response in regard to their attendance on the last day of an event, which helps you make a quick and informed decision that saves time and money. 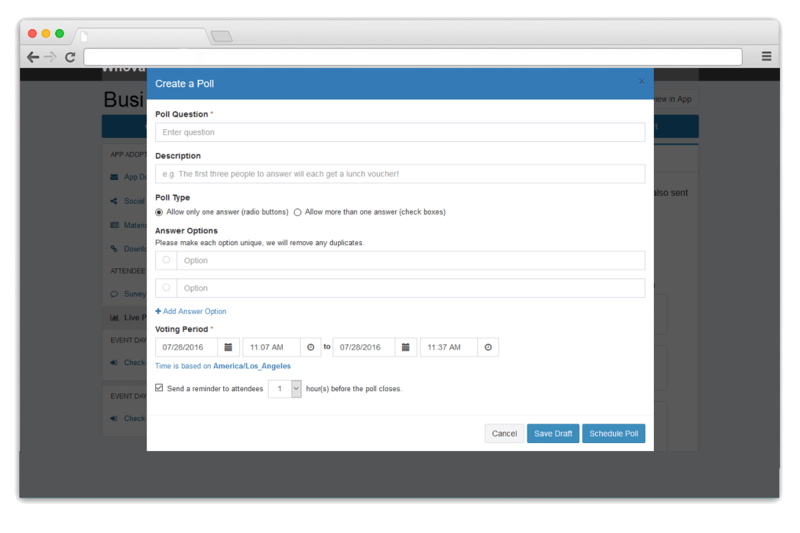 The live polling feature is offered for free for Whova customers. Are you interested in using the Whova app to make your upcoming events more engaging and exciting? Contact us here or email us at hello@whova.com.